Objective Erectile dysfunction (ED) is associated with an increased risk of cardiovascular disease in healthy men. However, the association between treatment for ED and death or cardiovascular outcomes after a first myocardial infarction (MI) is unknown. Methods In a Swedish nationwide cohort study all men <80 years of age without prior MI, or cardiac revascularisation, hospitalised for MI during 2007–2013 were included. Treatment for ED, defined as dispensed phosphodiesterase-5 inhibitors or alprostadil, was related to risk of death, MI, cardiac revascularisation or heart failure. Results Forty-three thousand one hundred and forty-five men with mean age 64 (±10) years were included, of whom 7.1% had ED medication dispensed during a mean 3.3 years (141 739 person-years) of follow­-up. Men with, compared with those without treatment for ED, had a 33% lower mortality (adjusted HR 0.67 (95%CI 0.55 to ­0.81)), and 40% lower risk of hospitalisation for heart failure (HR 0.60 (95% CI 0.44 to 0.82)). There was no association between treatment with alprostadil and mortality. The adjusted risk of death in men with 1, 2–5 and >5 dispensed prescriptions of phosphodiesterase-5 inhibitors was reduced by 34% (HR 0.66 (95% CI 0.38 to 1.15), 53% (HR 0.47 (95% CI 0.26 to 0.87) and 81% (HR 0.19 (95% CI 0.08 to 0.45), respectively, when compared with alprostadil treatment. Conclusions Treatment for ED after a first MI was associated with a reduced mortality and heart failure hospitalisation. Only men treated with phosphodiesterase-5 inhibitors had a reduced risk, which appeared to be dose-dependent. To the best of our knowledge there is no study which has investigated the association between treatment for ED, and long-term outcomes in men after a first myocardial infarction (MI). In order to investigate the association between treatment for ED, mortality and cardiovascular outcomes we conducted a nationwide cohort study which included all men with a first MI during 7 years in Sweden. From 1 January 2007 through 31 December 2013 we included all men 18–80 years of age with a first MI in Sweden. The patients were identified from the Swedish Patient Register, where all hospital stays are registered with a complete coverage of the country.7 The day of admission for MI was defined as the index date. We excluded men with MI, revascularisation (percutaneous coronary intervention (PCI), coronary artery bypass grafting (CABG)), prostatectomy, surgery for rectal cancer before the index date, or any dispensed medication for ED from 1 July 2005 until the index date. The recruitment of the study population is described in figure 1. Number of men eligible for inclusion, and those excluded according to the study protocol leading to the final study population. Numbers do not sum up to groups since subjects can be included in the No ED treatment category initially and later change to the treatement group. CABG, coronary artery bypass grafting; MI, myocardial infarction; PCI, percutaneous coronary intervention. The study complied with the guidelines of the Declaration of Helsinki and was approved by the regional ethics review board in Stockholm. Exposure was defined as at least one dispensed prescription of ED medication in the Prescribed Drug Register where all prescribed and dispensed medications in Sweden are registered with a complete coverage of the country since 1 July 2005.8 During the study period the following drugs for treatment of ED, with corresponding Anatomic Therapeutic Chemical codes, were available in Sweden: sildenafil (G04BE03), tadalafil (G04BE08), vardenafil (G04BE09), which all are phosphodiesterase-5 (PDE-5) inhibitors, and alprostadil (G04BE01), which contains prostaglandin E1. Comorbidities at baseline were retrieved from the Swedish Patient Register and defined as a discharge diagnosis in the primary position before the index date, except for active cancer which was defined as a diagnosis under the section C in International Classification of Disease version 10 during the 2 years preceding the index date, and diabetes which was defined as ongoing medication with any hypoglycaemic agent. Ongoing medication was defined as at least two dispensed medications during the year preceding the index date. Outcomes were retrieved from the Patient Register, only using diagnoses in the primary position. Major adverse cardiac event (MACE) was defined as a hospitalisation for MI, or heart failure, or revascularisation. Cardiovascular death was defined according to the definition of the European Society of Cardiology. Date and the primary cause of death were retrieved from the Cause-of-Death register where all deaths in Sweden are registered. Follow-up started 30 days after the index date, and ended for (A) all-cause mortality, cardiovascular mortality and non-cardiovascular mortality when the patient died, underwent prostatectomy or surgery for rectal cancer, or 31 December 2013, whichever occurred first, (B) for the specific outcomes analyses (MI, heart failure, revascularisation, MACE) when the patient was hospitalised for MI, or heart failure, or underwent revascularisation, underwent prostatectomy or surgery for rectal cancer, or 31 December2013, whichever occurred first. We computed descriptive statistics of patients’ characteristics assessed at the index date. For continuous variables we used t-tests and for categorical variables we used χ2 tests to assess differences between patients with, compared with those without, ED medication. 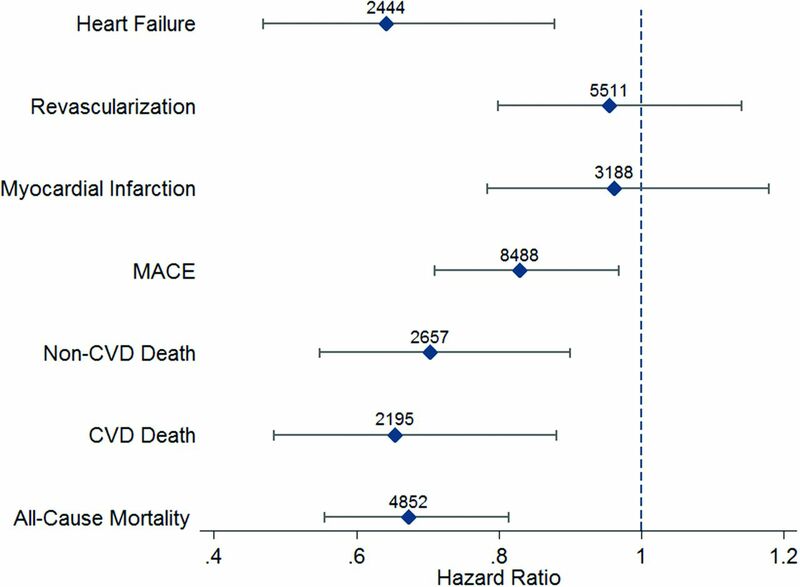 We used Cox proportional hazards regression model to estimate HRs with 95% CI to assess the role of treatment for ED on, (A) all-cause mortality, (B) MI, (C) heart failure, (D) revascularisation, (E) MACE, (F) cardiovascular mortality and (G) non-cardiovascular mortality, while adjusting for the following relevant variables: medications during follow-up (β-blockers, statins, nitrates, thiazide diuretics, opioids, selective serotonin reuptake inhibitors, ACE inhibitors/angiotensinogen-receptor blockers and neuroleptic drugs), comorbidities (chronic obstructive pulmonary disease, diabetes, stroke, peripheral vascular disease, heart failure and active cancer). We assessed comorbidities at the index date and included them as dichotomous variables. Ongoing medications at baseline and medications that were dispensed at least one time during the first 6 months following the event were adjusted for in our statistical models. Since virtually all patients who have been hospitalised with MI in Sweden will have nitrates prescribed at discharge, but most patients will never use them, for nitrates only, the subject was defined as user when the medication was dispensed for the second time during the follow-up. Moreover, we included treatment for ED as a time-varying variable, that is, the subject became exposed when ED medication was dispensed for the first time. In a second analysis we accounted for the type of the medication (PDE5-inhibitors or alprostadil) to study if the association of treatment for ED and the outcome all-cause mortality differed in relation to type of ED medication. Time since 30 days after the index date was used as the time scale in the Cox model, with age at the index date included as a continuous covariate in the model. We estimated HRs with 95% CI to assess the role of ED medication as a potential predictor of our outcomes, after adjusting for the other potential predictors. To assess the proportional hazards assumption, we used the deviance test based on scaled Schoenfeld residuals. When this assumption was not fulfilled, we fitted stratified Cox regression models. We performed a sensitivity analyses by starting follow-up 12 months after the index date, in order to investigate the importance of the time that elapsed between index date and the start of ED medication. p Values <0.05 were considered statistically significant. Data management and statistical analyses were performed using Stata 14 (Stata Corp, College Station, Texas, USA). Patients were not involved in the design of this study. In total, 43 145 men were included of whom 3068 had at least one ED medication dispensed during a mean 3.3 years (141 739 person-years) of follow-­up. Men who were treated for ED were younger, and less likely to have heart failure, diabetes, COPD, stroke, peripheral arterial disease and active cancer at baseline (table 1). In total, there were 4853 deaths during follow-up, 112 (3.7%) in men with treatment for ED and 4741 (12%) in men without treatment for ED (table 2). The incidence rate for death was less than half, and the risk of death was 33% lower in men with, compared with men without treatment for ED (adjusted HR 0.67 (95% CI 0.55 to 0.81)). When follow-up started at 365 days after the index date, the association between treatment for ED and death was virtually identical (data not shown). During follow-up there were 99 (3.4%) MIs in patients with treatment for ED and 3089 (7.7%) MIs in patients without treatment for ED. The incidence rate of MI was higher in men without than with treatment for ED, but after adjustment for confounders no association between treatment for ED and risk of MI was found (table 2). The incidence rate for heart failure hospitalisation was less than a third in men with treatment for ED, and they had a 40% lower risk of hospitalisation for heart failure during follow-up, compared with men without treatment for ED (adjusted HR 0.60 (95% CI 0.44 to 0.82)). We found an association between treatment for ED and risk of both cardiovascular and non-cardiovascular death, with a reduced mortality of 36% and 21%, respectively (table 3). The incidence rate for revascularisation was lower in men with treatment for ED, compared with men without treatment for ED (1.96 vs 4.54 cases/100 person-years), but after adjustment for confounders no association between treatment for ED and revascularisation was found. The incidence rate for MACE was almost a third, and the risk of MACE during follow-up was lower in men with compared with men without treatment for ED (adjusted HR 0.79 95% CI 0.68 to 0.92). The associations between treatment for ED and the different outcomes are summarised in figure 2. 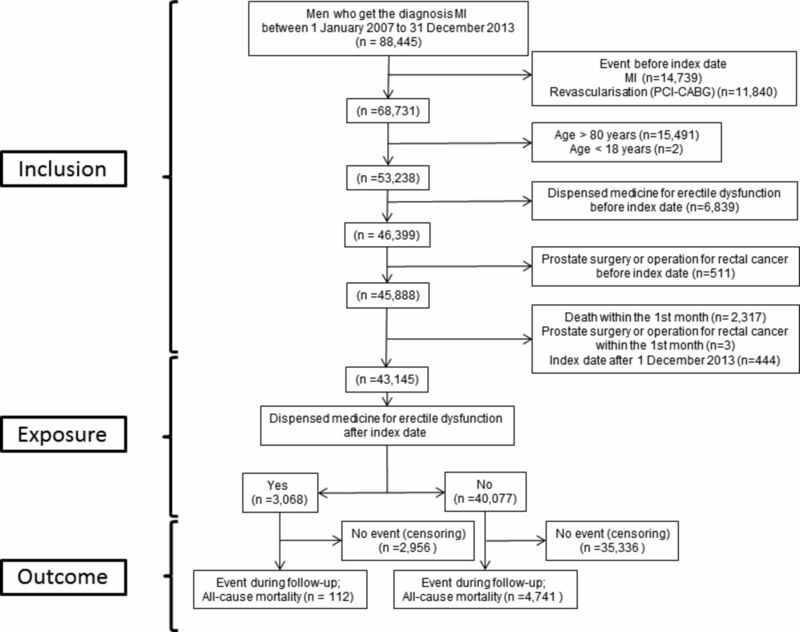 Adjusted HRs and 95% CI for the association between treatment for erectile dysfunction, compared with no treatment for erectile dysfunction, and outcomes after a first myocardial infarction in 43 145 men. Number of events are depicted above the point estimate for each outcome. MACE, major adverse cardiac event; CVD, cardiovascular disease. We found that among men <60 years, 60–69 years and 70–80 years of age 1273/13 882 (9.2%), 1296/15 029 (8.6%) and 499/14 234 (3.5%), respectively, were prescribed ED medication during follow-up. There was a strong inverse association between treatment for ED and risk of death in men 70–80 years of age, with a 59% reduced risk in those with treatment for ED, compared with those without treatment for ED (adjusted HR 0.41 (95% CI 0.28 to 0.59)). By contrast, there was no statistically significant association between treatment for ED and mortality in men <60 years and 60–69 years of age (see online supplementary table 1). However, the point estimate in men 60–69 years of age indicated a lower risk of death in men with treatment for ED, compared with men without treatment for ED. Similarly, in the age group 70–80 years, there was a reduced risk of hospitalisation for heart failure during follow-up in patients with treatment for ED (adjusted HR 0.51 (95% CI 0.30 to 0.89)). No association between treatment for ED and risk of MI during follow-up was found in any age group. The associations between treatment for ED and revascularisation, MACE, cardiovascular death and non-cardiovascular death in different age groups are described in table 2 (see online supplementary table 2). Among 3068 patients who were using ED medication, 2814 (92%) were using PDE5-inhibitors and 254 (8.3%) were using alprostadil. Among men who used PDE5-inhibitors 89 (3.2%) died during follow-up, compared with 23 (9.1%) among men who used alprostadil. The incidence rate of death per 100 person-years was 1.25 (95% CI 1.02 to 1.54) among PDE5-inhibitor users and 3.19 (95% CI 2.12 to 4.79) among alprostadil users. The risk of death during follow-up was 38% lower in men who were treated with PDE5-inhibitors, compared with those without PDE5-inhibitors or alprostadil (adjusted HR 0.62 (95% CI 0.50 to 0.77)). No association between risk of death and alprostadil use was found (adjusted HR 0.96 (95% CI 0.63 to 1.44)). When men who were using PDE5-inhibitors were categorised to those who had one, two to five and more than five numbers of dispensed prescriptions, and compared with men who were using alprostadil, the association between treatment with PDE5-inhibitors and reduced risk for all-cause mortality appeared to be dose dependent (adjusted HRs, 0.66 (95% CI, 0.38 to 1.15), 0.47 (95% CI 0.26 to 0.87) and 0.19 (95% CI 0.08 to 0.45), respectively). In this nationwide study, where all men with a first MI during 7 years in Sweden were included, and followed for a mean of 3.3 years, we found that treatment for ED was associated with a 33% reduced risk of mortality, and 40% reduced risk of hospitalisation for heart failure. A number of studies have previously investigated the association between ED, death and cardiovascular outcomes and provided contradictory results.1 3 These studies have been conducted both in men at high risk for cardiovascular events,5 6 as well as in presumably healthy men.9–12 One study reported outcomes in relation to ED both among men with and without previous cardiovascular disease.13 In one of two prospective randomised controlled trials, both conducted in high-risk populations, there was no increased mortality in men with ED, while in the other study ED was associated with a more than doubled risk of death.6 14 In addition, in men without previous cardiovascular disease, contradictory results have been found.10–13 The association between ED and risk of ischaemic heart disease appears to be stronger than the association for all-cause mortality, both in men with and without prevalent cardiovascular disease.1 3 These contradictory results may be related to differences in characteristics of the study populations in terms of age, comorbidities, medication, definition of ED, study design or other factors such as length of follow-up. Since we did not have any specific information on incident ED from questionnaires or any other source, and since we used dispensed ED medication as exposure and not ED itself, our findings are not directly comparable to earlier studies. However, we are confident that all patients who had ED medication dispensed in fact had ED. In two previous studies on patients with prevalent coronary artery disease the prevalence of ED was 41% and 47%, respectively.5 15 In one of these studies ED medication was reported and found to be used by only a third of the patients with ED.5 Thus, considering that less than 10% of the men in the present study had any ED medication dispensed, there was most likely a large number of men with ED who did not have any medication for ED prescribed. Consequently, our findings of a strong reduction in mortality and heart failure hospitalisation was most likely associated with treatment of ED, and not ED itself. The ability of ED to predict cardiovascular disease seems to be age related. The association is stronger among younger men, and appears to disappear or weaken markedly after the age of 60 years.16 26–28 In three previous studies, ED was not associated with cardiovascular disease in men above the age of 70 years.27–29 In another study there was even a trend to a reduced risk of incident cardiovascular disease in men 70 years of age or older with ED.26 These findings are interesting in the context of our study where we found a markedly reduced risk by 59% for death, and 49% for hospitalisation for heart failure among men 70 years of age or older who were treated for ED. In men 60 years to 69 years of age with treatment for ED there was a trend towards a reduced risk of mortality and heart failure. The main limitation of our study was that we studied treatment for ED and not ED itself. Most likely this introduced potential confounding bias, since men who were healthier may have been more prone to ask for treatment for ED. Indeed, patients with treatment for ED were younger, and healthier than patients without treatment for ED. However, even after adjustment for these differences there was a significant reduction in risk for adverse outcome among men with treatment for ED. There may have been other factors, which we had no information about, such as marital status, smoking, physical activity, disposable income or education level which may have been related both to the outcomes, and to the likelihood of being treated for ED, that may have affected our results. Indeed, in a previous study it was found that men with ED were more likely to ever have discussed ED with their general practitioner if they were married or had a higher education.30 Thus, our results have to be interpreted cautiously since treatment for ED most likely is a marker of good health and of higher income, a higher likelihood of being married, higher education, and a more active and healthy lifestyle in general. The analysis where the association between number of dispensed prescriptions and mortality was investigated was not done using the exposure as a time-varying covariate since this would have significantly reduced the number of exposed and events. Thus, these figures have to be interpreted cautiously since this may have introduced immortal time bias, meaning that men who had more dispensed prescriptions had to be alive longer in order to be able to get them. Also, we did not have information about blood pressure levels which may have affected the willingness of the physician to prescribe ED medication. The main strength of our study was the large study population, the high-quality healthcare registers from which we retrieved the study population, and where patient characteristics and outcomes have been found to have high validity in previous studies.7 Furthermore, we had information on all medications that were dispensed during follow-up, including those which may affect erectile function, as antidepressants, opioids and antipsychotics.8 Information from these registers allowed us to exclude patients with organic reasons for ED as surgery in the pelvic region, and to adjust for treatment for ED that may have been related to psychiatric disease, or use of opioids. Furthermore, as the coverage of these registers is virtually complete and countrywide, the risk of misclassification of exposure or outcome was small, and there was no loss to follow-up. We found that men who were treated for ED after a first MI had a reduced risk of death and hospitalisation for heart failure. Men who were treated with PDE5-inhibitors had a markedly reduced risk of death or heart failure, which appeared to be dose dependent, whereas those with alprostadil treatment had a similar risk of adverse outcome as men with no treatment for ED. Since treatment for ED is associated with confounding by indication, meaning that healthier men are more likely to get treatment for ED, our results should be interpreted cautiously. Erectile dysfunction (ED) is associated with an increased risk of cardiovascular disease in previously healthy men. The association between treatment for ED and death, or cardiovascular outcomes after a first myocardial infarction (MI) is unknown. In this observational, nationwide study that included 43 145 men with a first MI we found that treatment with phosphodiesterase-5 inhibitors was associated with a markedly reduced risk of death, and hospitalisation for heart failure. Our findings indicate that treatment with phosphodiesterase-5 inhibitors may be related to a reduced risk of long-term adverse outcomes after MI. However, our findings have to be interpreted cautiously since we were not able to adjust for marital status, household income or other lifestyle factors that may be related to both the use of ED medication and prognosis.
. PDE5 inhibitors in non-urological conditions. Curr Pharm Des 2009;15:3521–39.
. Men in Australia telephone survey (MATeS): predictors of men's help-seeking behaviour for reproductive health disorders. Med J Aust 2006;185:418–22. Contributor Study concept and design, analysis and interpretation of data, critical revision of the manuscript for important intellectual content: all authors. Acquisition of data: MJH. Drafting of the manuscript: DPA and MJH. Statistical analysis: AG and RB. Funding No specific funding was obtained for this study. MJH holds a research position funded by Swedish Heart-Lung Foundation (grant 20150603), YTL and DPA both had research positions funded by the regional agreement on medical training and clinical research between Stockholm County Council and Karolinska Institutet. Correction notice Since this paper was first published online the full text version has been updated. The results section in the abstract which stated ‘7.1% had ED medication dispensed during a mean 6.2 years (141 739 person-years) of follow-up.’ now states ‘a mean 3.3 years (141 739 person-years) of follow-up.’ This update was also made in two other sections of the article. Erectile dysfunction and cardiovascular disease: a suitable case for treatment and prevention?